The novels of Stephen King have been made into several movies and TV shows with varying degrees of success and quality. 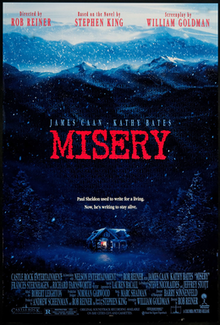 “Misery” is one of the good ones second only to “The Shawshank Redemption.” “Misery” gathered together the best talent in all aspects and created a modern horror masterpiece. 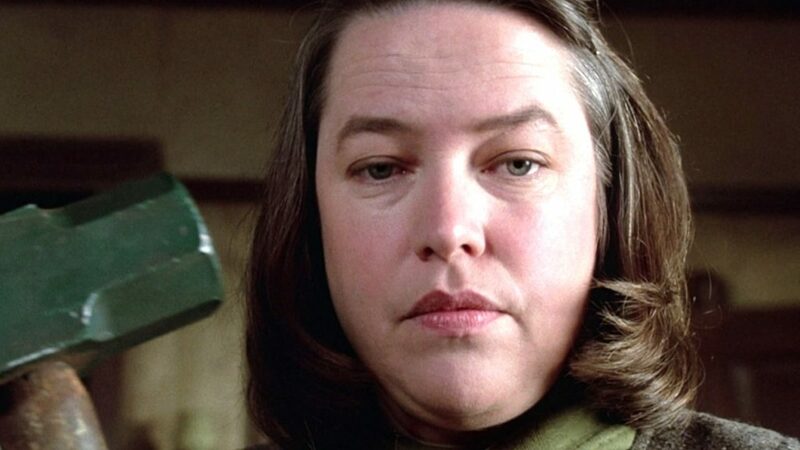 Kathy Bates’s role of Annie Wilkes won her the Best Actress Academy Award for 1991. Her portrayal of an unhinged and delusional super fan of romance novelist Paul Sheldon was simply amazing and terrifying. James Caan, who is usually cast as the tough guy, plays a sensitive writer who upon finishing his new novel crashes his car in the snowy Colorado Mountains. This setting made me think of the “The Shining” another King masterpiece. When Paul comes too, we hear Annie’s words echo “I’m your number one fan”. Paul’s injuries leave him bedridden, but Annie, a former nurse, takes care of him. She seems sweet and innocent wearing a gold cross around her neck, but her behavior gets increasingly erratic. Upon reading Paul’s new manuscript and the fact that he has killed off Misery, the female heroine of his romance novels, Annie goes a little berserk. She has Paul burn the pages and re-write “a better story”. Paul needs to build up his strength and formulate a plan to get out. He has Annie go to the store to get a certain kind of paper which allows him and his wheelchair to get out of his room and explore the house. Although when she finds out this leads to one of the best and most cringe-inducing scenes of the film. Annie Wilkes is one of the great female horror icons for which there are very few. She is right up there with Mrs. Vorhees from “Friday the 13th”. She is a very human and complex character who is extremely disturbed. Buster the local sheriff is an old-timer played by Richard Farnsworth. He and his clerk/wife Virginia pretty much make up the police force of the small sleepy town. They have some really nice scenes together, but when he goes to investigate the Wilkes house he is in for a few surprises. It’s up to Paul to save himself and when Annie has reached the end of her rope its do or die. The movie is about these two characters and the cat and mouse game they play. Both actors turn in brilliant performances. The script was written by the legendary William Goldman and directed by Rob Reiner. "The Eyes of My Mother" is a Must See!